When I see a specific movie is getting the “Art and Making of” treatment, I always get excited to get to see the film from another view but I get more excited when it is being released by Insight Editions. Insight always gives their releases a little extra. They have fold out posters or little index cards glued to pages to lift and reveal more info, I really enjoy this “gimmick”, if you want to call it that. This adds a whole new interactive level to the book. Personally I wasn’t a huge fan of this film but the book does do the film justice and it is a must have for fans for sure! “Pacific Rim: Uprising” is a big movie and has a lot of great detail that is showcased in this book and allows you to go deeper into the mythology and world of that the movie continues from the 2013 Guillermo del Toro directed predecessor. 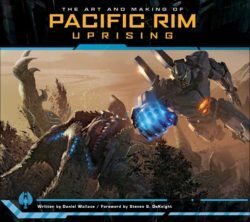 If you are looking to be transported behind the scenes and right into the middle of the epic battle between Kaiju and Jaegers then pick up “The Art and Making of Pacific Rim Uprising” because it delivers that…and then on the next page gives blueprints on the robots and CGI breakdown and showcases the beautiful concept art from the film. This book was a page turner for sure or rather hard to turn to the next page because their was so much to look at in detail in each page! Got excited (and a bit concerned) for a minute that this book was authored by Daniel Wallace, the author of “Big Fish”, which was made into a movie by Tim Burton…but same name different guy. This Daniel Wallace is definitely still the right man for this book. I am well aware of his work in books “Star Wars Year by Year: A Visual History” and “Ghostbusters: The Ultimate Visual History”, which is another amazing book from Insight Editions. Even though, I didn’t love the movie I still really enjoyed the book. The sequel’s director, Steven S. DeKnight, gives a good foreword as well and give wrap-up and I did how he came as a fan of the series to end up directing the next film. This book is jam packed with great images and content. check it fans of “Pacific Rim”.